There have been fan clubs around almost as long as there have been celebrities. Some historians point to the 1800s as the time when the term became synonymous with people who followed a particular sport. By the time professional sports, record distribution, radio and movies became nationally popular in the early part of the twentieth century, fan clubs emerged in many forms to follow this new celebrity class. Very quickly, savvy public relations people at record companies and movie studios saw the burgeoning fan scene as a marketing opportunity to control a celebrity’s image and launch new ventures to a group eager for any news from their idols. Then, as now, some celebrities chose to be greatly involved with their fan base, while others had a fictional life created about them, conjured up by people looking to profit from the star’s talent. Some celebrities eclipsed others as the kings and queens of fandom. For our parents, Frank Sinatra was certainly one, as was Babe Ruth before him. Yet it was the Boomer Generation that took the idea of fan clubs to a whole new level. While traditional methods of reaching a fan audience were still in place — namely, magazines, radio and direct mail — television, portable transistor radios and a blossoming advertising industry targeting boomers kicked things up a notch. This was decades before the Internet would allow for instantaneous delivery of information. Children’s television began getting in on the act in a big way in the early boomer days, starting with The Howdy Doody Show (1947-60) and Davy Crockett (1954-55). Boomer kids were bombarded with fan merchandising on a level not seen previously, in addition to offering genuine fan club cards. Radio shows of the 1930s could not compete with the visuals in your living room supplied by television. Many boomer boys did not know the name Fess Parker, so they were not fans of the actor per se, but they knew he was Davy Crockett and wanted a hat just like his. TV went one step further with The Mickey Mouse Club (1955-59). Each show was designed as if it were a “meeting” of the fan club, led by Mickey himself. Around the same time, the eldest boomers and their older siblings were becoming Elvis fans. Elvis became the subject of the largest number of fan clubs. He had legions of fans everywhere he went as they shared information of his appearances, conveniently provided by his managers. Hollywood celebrities each had fan clubs as a way of keeping the star in the public eye, especially those looking to inflate the popularity of an actor or get a fresh face out in front of an audience. Some fan clubs, however, where completely run by the fans themselves. They shared and traded memorabilia and stories about the object of their affection. In later years, the fan convention came into being. Celebrities totally involved with their fans often had a working relationship with the club’s staff, and would make an appearance. This was the ultimate photo op precursor to today’s selfie explosion, only in boomer days, the object was to be photographed with a celebrity, not be the celebrity. Teen fan magazines (also known as fanzines), a spin-off of the Hollywood gossip magazines popular in the 1930s and ’40s, reached a welcoming baby boomer audience in the 1950s and ’60s, especially among girls. There were dozens of them, including Seventeen, Calling All Girls (later called Young Miss), 16 Magazine and Tiger Beat. Photos of stars (suitable to tape up on bedroom mirrors, doors and walls), application forms to join fan clubs, info on who was dating whom, answers to questions about stars’ favorite colors and foods, all kept eager fans reading and anticipating the next release of their idols, be it a movie, TV show or record. By the time The Beatles toured the U.S. in 1964, the boomer-age fan machine was in full swing. The band was on U.S. radio a year before they played their first note on American soil. Fanzines stoked the embers of young fan love by publishing pictures of the Fab Four, going to the point of printing, “Sorry, girls, he’s married!” below a picture of John Lennon. The Beatles had a huge fan base before they had an organized, “official” fan club. When they finally broke up in 1970, there were dozens if not hundreds of fan clubs dedicated to The Beatles around the world. 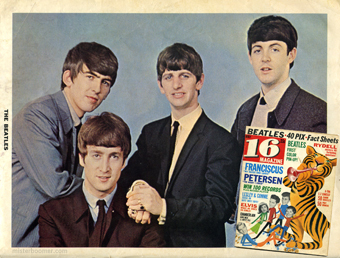 16 Magazine boasts “Beatles: First Color Pin-Up” on this May 1964 cover from Mister B’s collection of his sister’s fanzines. Notice how Bobby Rydell and The Beatles headlines are at the top of the cover, with Elvis news relegated near the bottom as the new age of rock ‘n roll and boomer celebrities slowly replaced the old. Fan clubs, created by marketers or by fans, covered the gamut from music to sports to movies. Troy Donahue had a fan club; so did Mickey Mantle, Brenda Lee, Connie Francis and Richard Chamberlain. TV shows also had fan clubs. American Bandstand had one for each of their featured dancers. Later they were combined into one, which is still active today. Mister Boomer was part of only one fan club — to which he still owns the card, too. It was for the Soupy Sales Fan Club. The card was issued as a promotion from a dairy company, which was a local sponsor of the TV show. In short, if you were popular in music, TV, sports or movies in the 1950s, ’60s or ’70s, you probably had a fan club. Today, fan clubs are still out there, but their impact is diminished or perhaps absorbed by social media. Were you a card-carrying member of a fan club, boomers? Do you still have the card? If you were born in the second half of the boomer era, you’ll remember The Banana Splits Adventure Hour. It was a TV show produced by Hanna-Barbera that featured a fictional “bubble gum pop, rock ‘n roll” band of anthropomorphic characters: a dog, a gorilla, a lion and an elephant. Fleegle (a Beagle) played guitar and sang, Bingo played drums and sang, Drooper was the bass player and contributed vocals and Snorky (aka Snork) played keyboards and added effects. The show, which featured cartoons, live skits, musical numbers and live-action serial stories, ran from September 1968 to September 1970. It was patterned after The Monkees and Rowan & Martin’s Laugh-In and was sponsored by Kellogg’s cereals. The show’s premise was that each episode was like a meeting of The Banana Splits Fan Club. All the characters spoke except for Snork, who communicated through a honking sound reminiscent of Harpo Marx. It was, like The Monkees (and A Hard Day’s Night before that), pure slapstick humor. As became typical with so many TV shows of the boomer era, people who worked on the show went on to greater fame and fortune. Jan Michael Vincent was one of the actors in the live-action Danger Island stories, which were directed by Richard Donner. Boomers will remember Vincent co-starring opposite Charles Bronson in The Mechanic (1970) and his numerous TV appearances in the 1980s. Richard Donner was already known as a director before The Banana Splits, having worked on TV commercials and a host of popular TV shows in the 1950s and ’60, as well as on feature films. His breakout movie, though, will be familiar to boomers — The Omen (1976). Two years later he directed Superman, starring Christopher Reeves. Among the most notable people who worked on the show are Sid and Marty Kroff, who designed the costumes and sets. Hanna-Barbera approached the puppet makers to create the Banana Splits characters. As a result of their work, NBC offered them their own show, which they named H.R. Pufnstuf, which was launched during a Banana Splits special in 1969. Since The Banana Splits were supposed to be a band, the show needed music, too. Al Kooper Barry White, Gene Pitney and Jimmy Radcliffe were among the musicians who contributed their talent to The Banana Splits songs. The show’s theme song, The Tra La La Song (one Banana, Two Banana), was composed by Nelson Brock Winkless, Jr. Boomers know his work, if not his name, since he had previously the composed the Kellogg’s Corn Flakes Good Morning, Good Morning and Rice Krispies Snap, Crackle, Pop jingles. Due to contractual considerations, credit for The Banana Splits song went to Ritchie Adams and Mark Barkan. Barkan was one of the musical directors on the show. An album of The Banana Splits music was released in 1969, as well as singles that included The Tra La La song, but the band did not capture boomers’ musical attention the way The Monkees had. Since Kellogg’s was the show’s sponsor, a full-on blitz of merchandising was put into motion to publicize the show and its sponsor. A variety of toys, puppets and dolls of the characters were made, along with their likenesses adorning posters, lunch boxes, cups, coloring books and more. The Aurora Plastics Corporation produced model kits of the six-wheel all-terrain vehicles driven by the characters on the show. Unlike the model car, airplane and boat kits made by Aurora that many boomer boys were familiar with, though, these kits were conceptualized as a toy more than a model, so assembly was simple enough for younger fans of the show. Kellogg’s released two EP 45s of The Banana Splits music as flexi-discs on the back of cereal boxes in 1969, and Gold Key released a Banana Splits storyline in a comic book. Mister Boomer was in high school by the time the show appeared, and could not warm to the kiddie-centric shenanigans of the show’s characters. But he remembers his younger sister watching the show. Naturally, she could “tra la la” along with the show’s opening song and seemed to enjoy the slapstick humor of the characters bumping into each other and running into a host of things with their vehicles. How about you, boomers? Do you remember The Banana Splits Adventure Hour and are now kicking yourself for not holding on to your Banana Splits collectibles?